If you have recently been annoyed by advertisements labeled “Ads by Water Plant” or “Provided by Water Plant,” then you have been infected with the Water Plant adware program. Apart from being annoying and intrusive, this application is also unreliable, because it promotes various shady entities. We are of the opinion that users should remove this program in order to maintain their computers’ safe from cyber fraud and malware infections. So, if you are looking for more information about this infection, you’ve come to the right place. We have gathered as much information about Water Plant possible, and we have composed a manual removal guide that can be found at the end of this article. 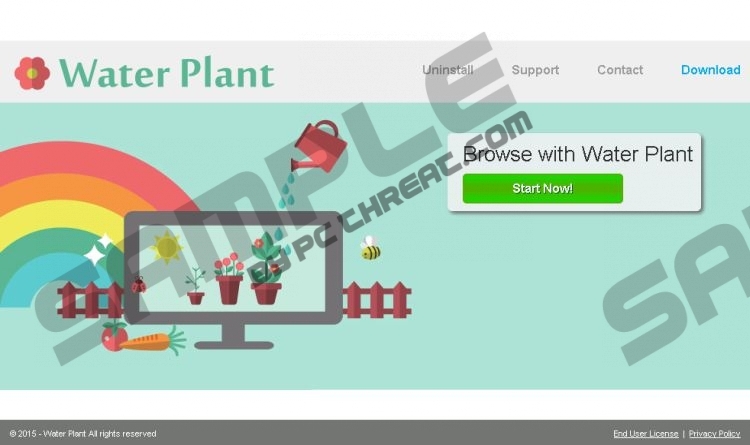 Water Plant has been developed by SuperWeb, a notorious company, known to have developed numerous other adware applications such as Special Box, Wild West, Fruit Basket, Swift Record, and so on. Note that you should remove all of these applications if you ever encounter any one of them. The aforementioned applications are basically clones of each other that have received a facelift from their developers. The only thing that differs is the name and the background picture of their websites. Waterplantplace.com is the website assigned to this adware. It features a download button that doesn’t work, and in fact, the website serves no purpose whatsoever. Nevertheless, you might get infected with Water Plant if you download freeware bundles that can be downloaded from freeware distribution sites such as Soft32.com, Brothersoft.com, and so on. However, it doesn’t mean that you will definitely get infected with Water Plant when installing a bundle containing it. You have a choice in the matter, since you can remove the malicious app from the installation process by unchecking the checkbox when running the installation wizard. Users should remove Water Plant, because it displays unreliable commercial advertisements that are supplied by shady businesses, and possibly cyber criminals. Note, that the ads are mostly shown as pop-ups, coupons, in-text ads, and so on. You might end up feeling angry after purchasing a product or a service that you haven’t received. Even more worrying is the fact that Water Plant could redirect you to an infected website. Your computer might get infected with malicious applications such as ransomware, spyware, rogue anti-spyware, browser hijackers, and so on. We highly recommend that you remove this infection, because it poses a significant threat to your system’s security. You might get your computer infected with malware or simply get duped by purchasing something form fake online shopping websites. So, if you wish to remove Water Plant, please follow our removal guide below. Find Water Plant and click Uninstall. Quick & tested solution for Water Plant removal.